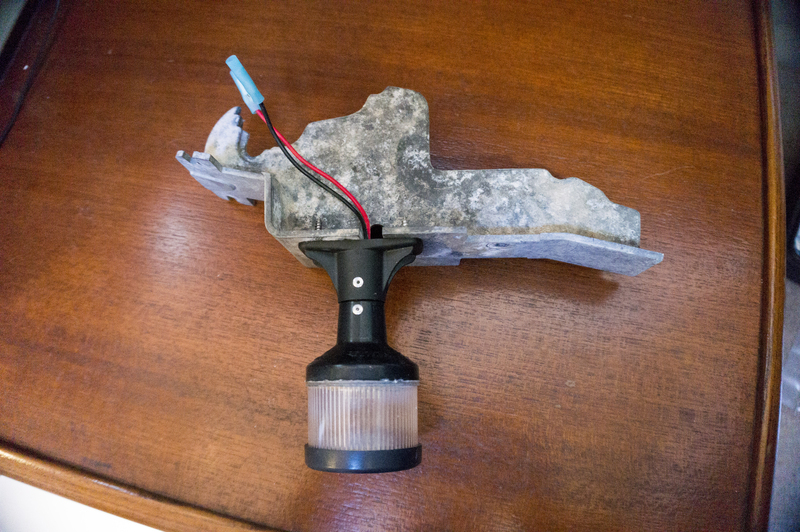 Many months ago our friend Rene had donated this Seasense LED anchor light he had left over after a project on his Morgan. Many thanks, Rene! This weekend it was finally warm enough to tackle the job. 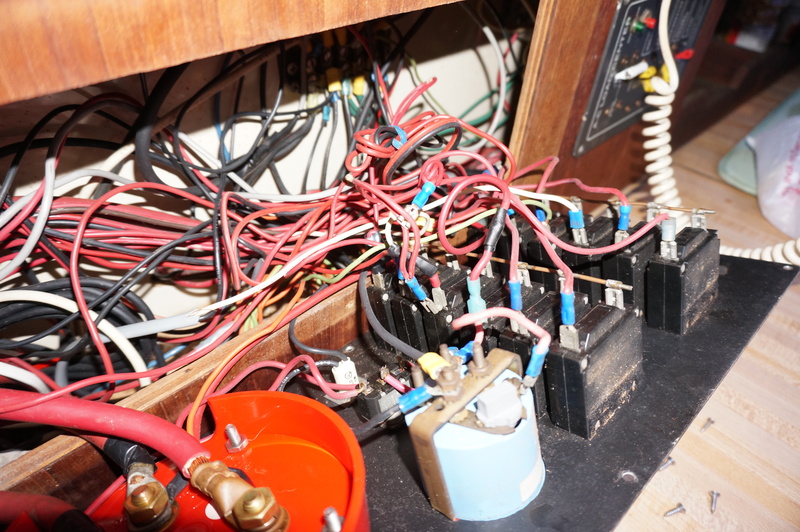 However, first I had to do some investigation and answer some important questions like, where did the anchor light switch and wiring go? I wasn’t sure if I was going to have to run all new wire or not. Gimme Shelter came with a “solar charger.” Basically there was a huge 15 watt panel in the aft berth with a 12v DC plug. 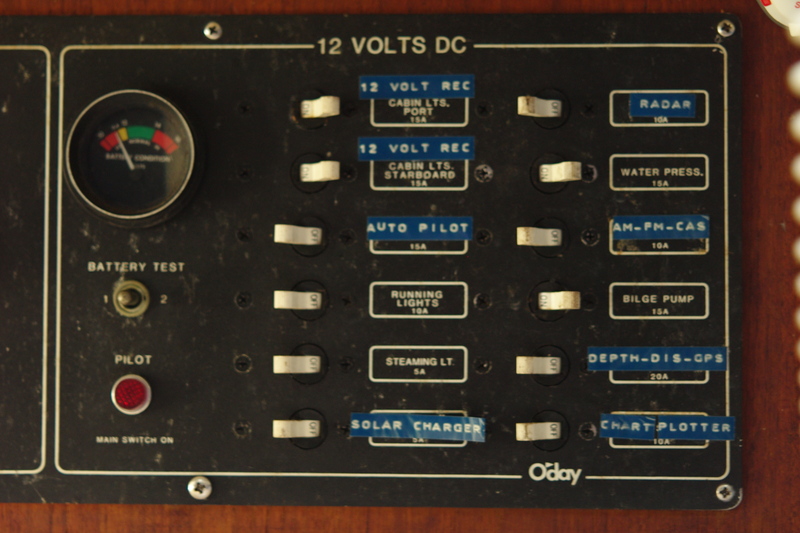 If you carried the giant, outdated panel outside and plugged it into the 12v socket in the binnacle, then flipped that “solar charger” switch, the panel would ever-so-slightly feed the batteries. 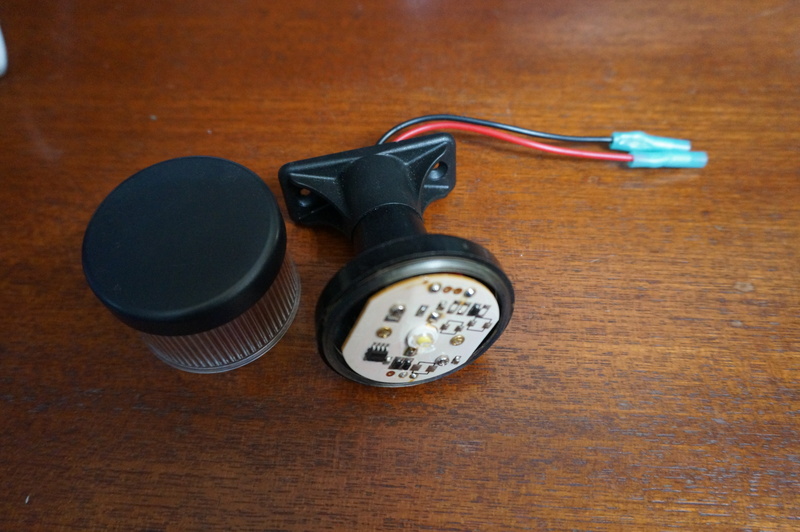 I decided the “solar charger” switch was probably a good place to start looking for anchor light clues. Yep, under the solar charger label was the anchor light switch. 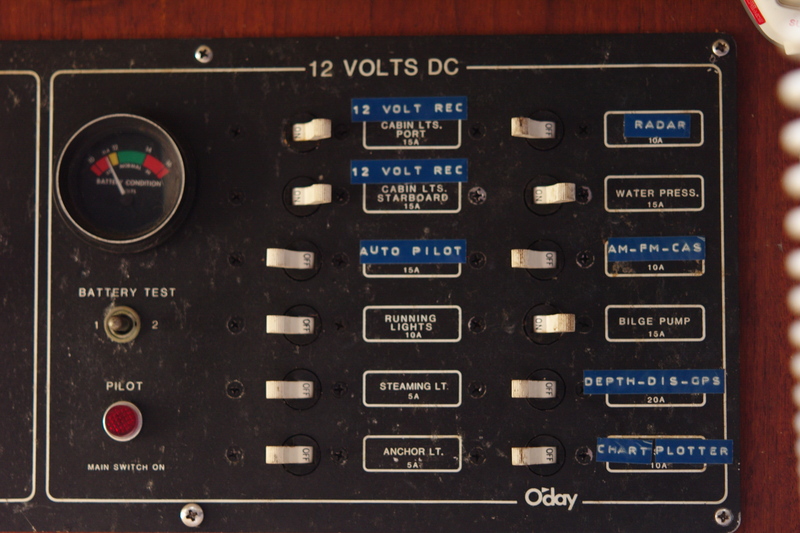 However, it obviously was no longer wired to the anchor light, so the investigation had to move behind the panel. 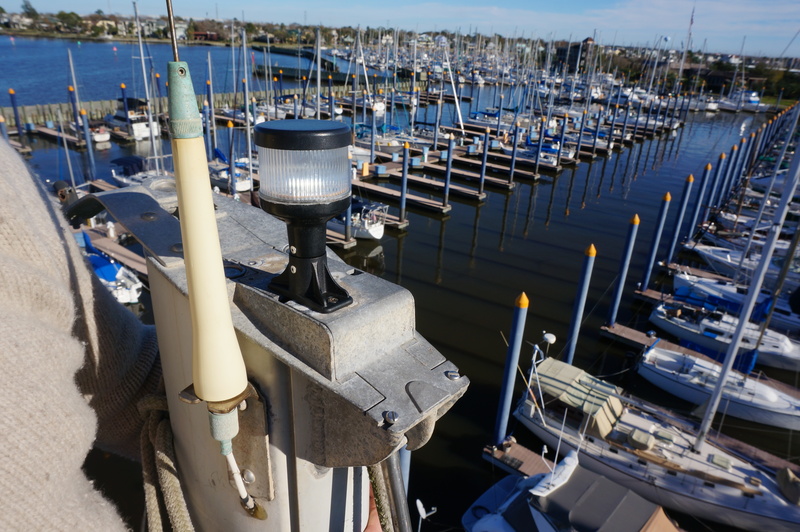 The anchor light wires were still attached to the plug and running up the mast, but we had no idea if they still made it all the way to the top, and there was only one way to find out. It was time to put on the harness and head up the beanstalk. Since Mary doesn’t have the strength to crank me up the mast, and she doesn’t care for heights, we invested in a MastMate. 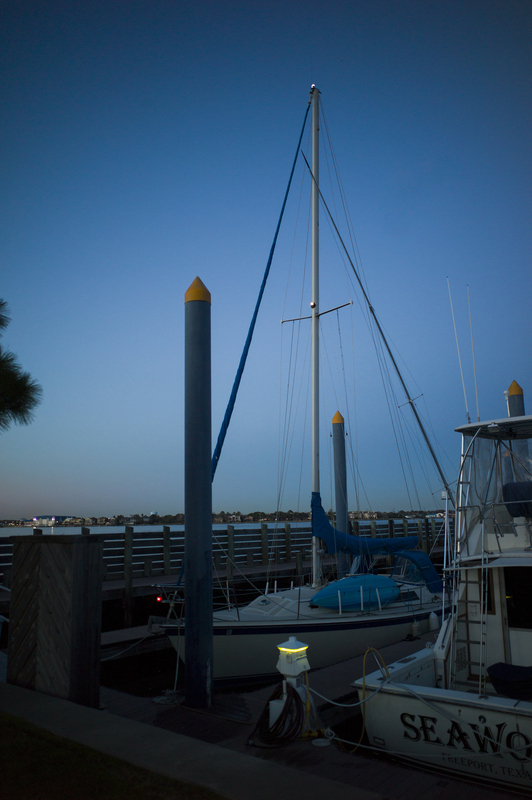 It’s a nylon ladder that connects to the main halyard and runs up the sail track. I still wear a harness and connect the topping lift to my harness just in case, but it makes going up and down much easier. Mary just takes up or lets out slack and ties me off instead of having to crank me up. I was greeted at the top with a disturbing sight. A lizard was literally impaled on the end of the windex. How does that even happen? I’d taken up a bag of tools, so I went to work unscrewing the cap to the top of the mast. However, once unscrewed the top wouldn’t budge. I had to retreat down the mast to find a pry bar. Once back up the mast with the biggest screwdriver in the box, I did manage to pop the top and found this. Can anyone enlighten me as to why there are two sheaves in the middle of the mast? 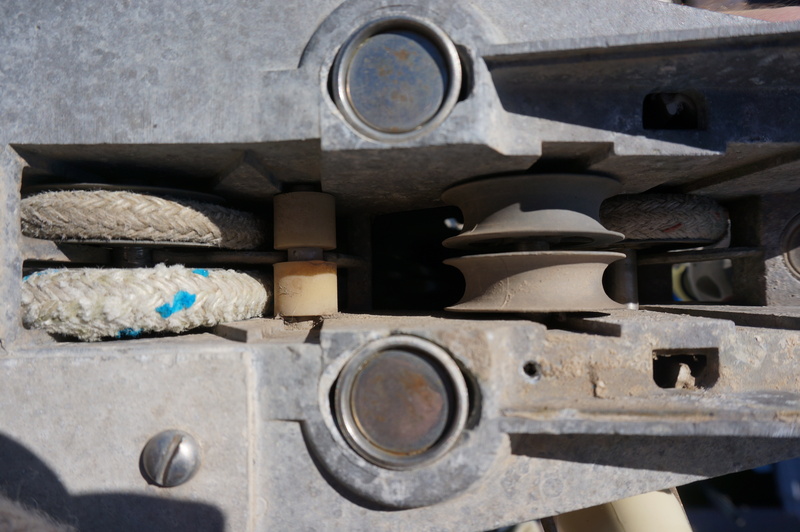 If they had been the same size as the sheaves in front I would have switched them out, so I could run a second jib halyard, but they weren’t quite the same size. I lifted them out and began searching for the anchor light wires. At this point I needed to take another break, so I left the vice grips holding the wires and climbed back down with the mast cap. I decided the easiest plan of action was to mount the light to the cap on the ground, then take it all back up as one piece for installation. In the perfect world I would have cleaned and repainted the cap, but even though this project was going surprisingly well, I was still running out of daylight, and I needed to get everything back together before heading home. For the third time I climbed the mast. I crimped the wires together, taped it all up, released the vice grips and screwed the top back into place. And just as I leaned back to bask in the glory of my flawless victory, I broke off the windex! I wasn’t too upset. I mean, there was a dead lizard stuck on it anyway. I ended the day with only one injury. 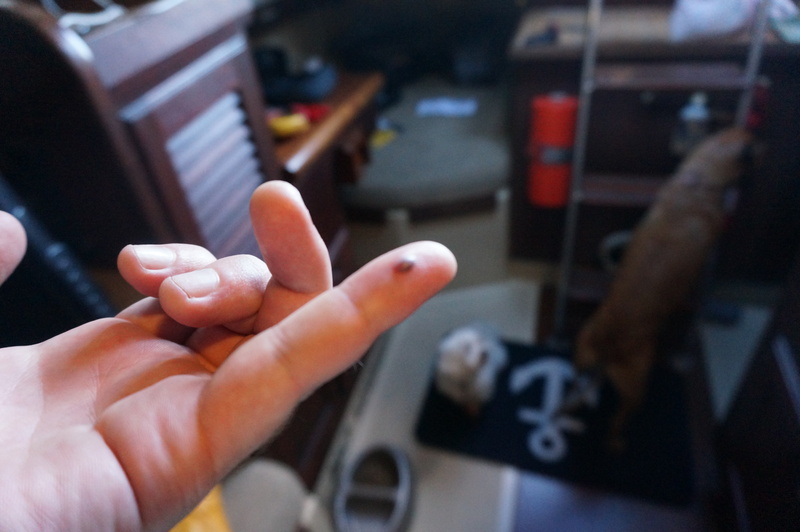 Somehow I gave myself a blood blister on my pinkie – no idea how. It felt so good to finally scratch the anchor light off our work list (even though I had to pencil in “replace windex” at the bottom). I was amazed that we never even had to make a trip to West Marine! I don’t know if that means we’re getting better at projects or that we got really lucky this time. We finally have all of our lights functioning. 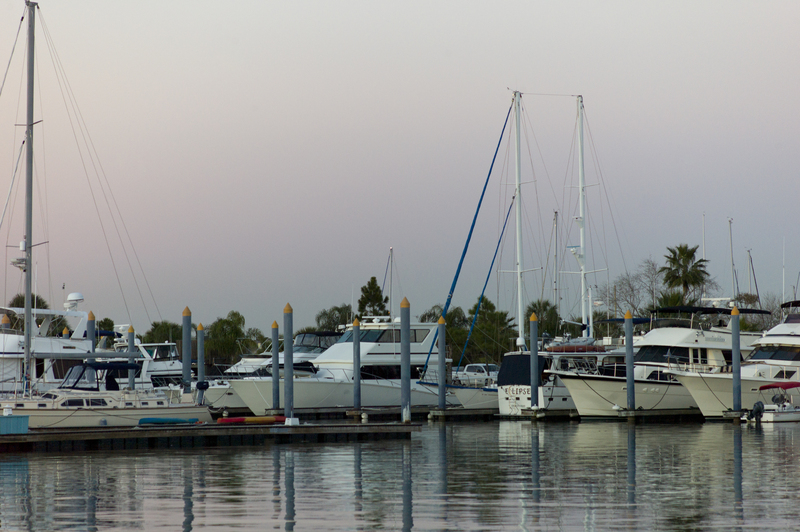 Hopefully we will spend many nights anchored out this year. I’m going to guess that a fairly smart bird brought his snack up there and stuck it on a handy ‘branch’. Not all that bright, though, since he seems to have forgotten about it. 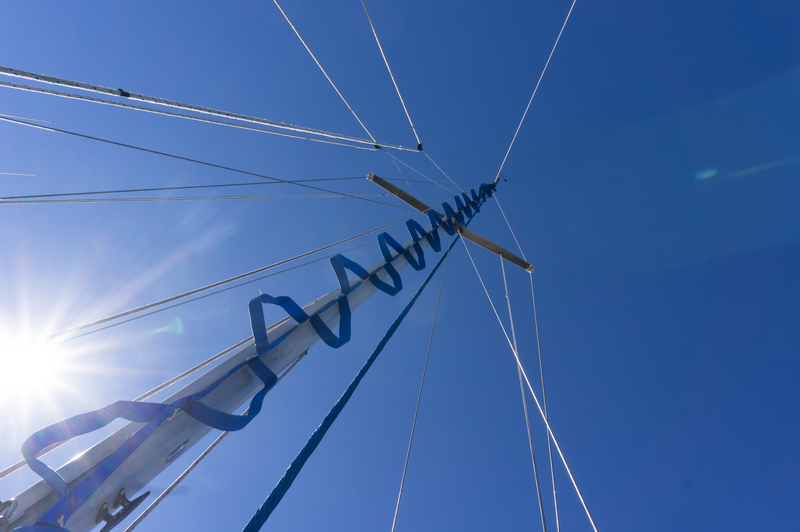 We are doing the same thing today–and I will be going up the mast to complete the project! Thanks for the encouragement through your article. 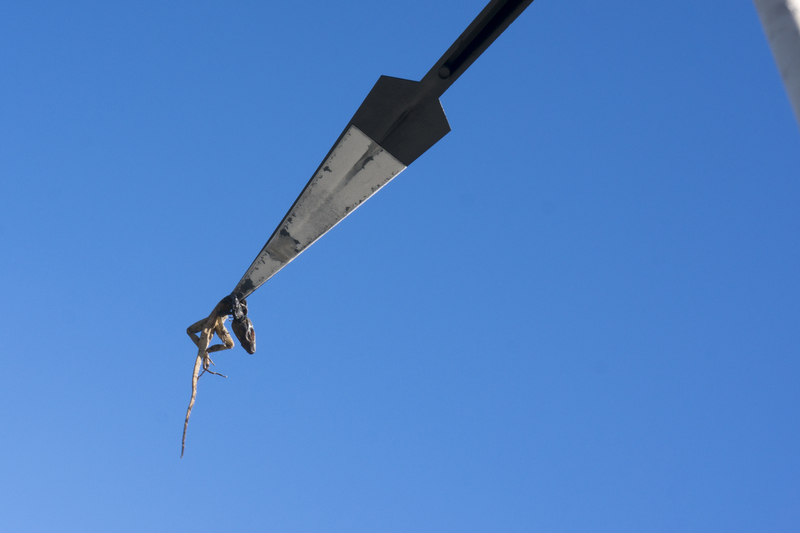 =) My husband and I both laughed about the lizard at the top of your mast–how does that even happen?